Dawsonville Dance is located at 258 Beartooth Pkwy in Dawsonville and is very close to Hwy 53 and GA 400. We are suite 170 in the Bear Praise Center. 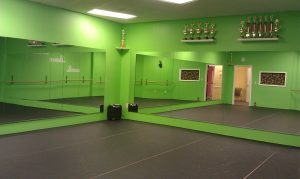 Dawsonville Dance has two dance studio rooms where classes are taught. Both studios are complete with wooden barres running the length of the studio and 2 fully mirrored walls. Dawsonville Dance has a professional sprung dance floor. We took great care in researching what kind of floor would best meet our studios needs and help protect our students. Our floor starts with high density foam blocks, placed on the corners of every square foot. On top of that are 2 layers of plywood, off set to avoid any seams. Finally there is our professional vinyl dance floor laid on top. We picked this floor with our students safety in mind to help protect their knees and ankles.